The crane scale TZR series is a measuring device for determining tensile forces. Scales with crane hooks are used in the same way. 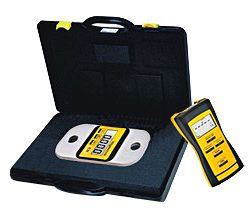 The crane scale series TZF has an external load indicator with radio transmission. 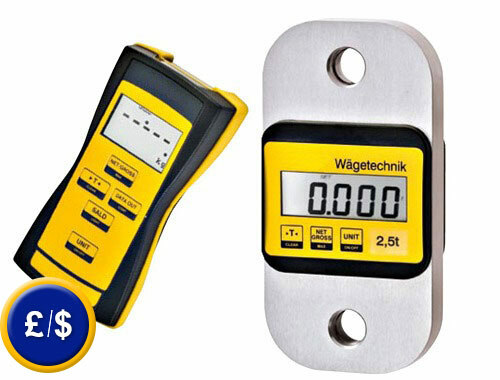 The crane scale allows you to read the measurement values in the external display and transmit it by means of USB port to computer. For this we offer you the software with the data cable as an optional component to order. The external display has all the functions of the crane scale. The crane scale comprises a housing that includes LCD screen. Due to its versatility the crane scale can be used for different purposes. Whether to measure tensile forces or to use it as a balance (balance crane), the crane scale is a robust solution for different fields of application. Optionally we offer the shackle and hook to hang the load directly from the crane scale. You can also combine the loading crane with a hook and a shackle. The crane scale has LCD display for easy reading. The display of the crane scale shows the gross/net value of the current load or the maximum value. The tare function can be performed throughout the weight range. If you have questions about the crane scale, please ee the technical data below or contact us: +44 ( 0 ) 2380 98703 0. Our technicians and engineers will be happy to advise you on the crane scale and on any product of our systems of regulation and control, meters or scales. The delivery does not include a crane hook or a shackle.